This recipe is for OUTSIDE gas or charcoal plank-grilling. Soaking the planks: Pre-soak cedar planks for at least 1 hour, preferably longer or overnight. Weigh down planks with heavy cans or stones to completely submerge the wood in water. Lightly coat the salmon with olive oil and season with salt and pepper. Place salmon on cedar plank skin-side down. Turn on your gas grill to high heat. 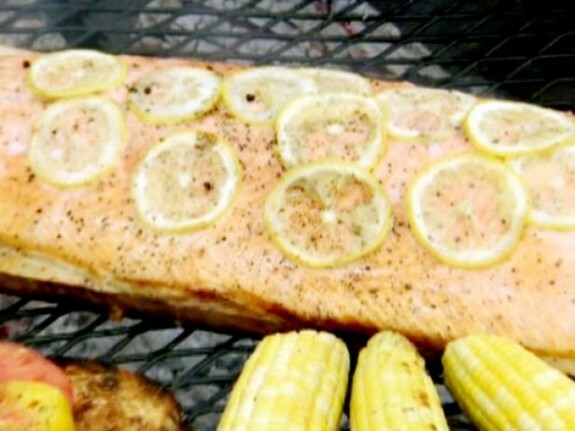 Place planks (loaded up with salmon) on the grill and close lid. Your grill will now turn into an oven/smoker. Cooking time required will vary depending on the size of the salmon. Be careful when you are lifting the grill lid because the burning plank will produce a lot of smoke. Try to keep the lid closed as much as possible as not to lower the temperature inside the grill. When salmon is cooked, remove fish from plank and plunge wood into a bucket of cold water. Serve the salmon immediately with the Cilantro Pesto. Place first 4 ingredients in blender or small food processor and completely puree. Add lime juice, jalapeno, and salt and pepper, to taste. Professional Recipe: This recipe was provided by a chef, restaurant or culinary professional and makes a large quantity. The Food Network Kitchens chefs have not tested this recipe in the proportions indicated and therefore cannot make any representation as to the results.